For most people, broccoli is one of the standard foods the rule-of-health phrase "eat your greens" brings to mind. This important vegetable also provides a nutrient-packed addition to the world of vegetable foods in the diminutive form of its sprouted seeds. According to Johns Hopkins University, 3-day-old broccoli sprouts contain as much as 50 times the amount of some of the health-boosting phytonutrients of the mature broccoli head. Both forms of broccoli provide valuable nutrition in a delicious and convenient form. Broccoli contains a wealth of nutrients, including more than 1,000 I.U. of vitamin A, 58 mg of vitamin C, 36 mg of calcium and 1.4 micrograms of selenium in a steamed one-half cup serving. By contrast, broccoli sprouts contain about half as much vitamin A as mature broccoli and a third of the vitamin C. Broccoli sprouts are a better source of vitamin K, with nearly 38 micrograms per half-cup serving, well exceeding mature broccoli, which contains 0.4 micrograms per half-cup. However, the nutrient that makes broccoli sprouts famous is sulphoraphane, a compound with purported anticancer and antidiabetic properties that is present in high concentrations in 3- to 4-day-old broccoli sprouts. Two phytochemical compounds in broccoli known as diindolylmethane and indole-3-carbinol were found to have inhibitory properties against prostate cancer in a study published in the April 2011 issue of the journal "Molecular Carcinogenesis." The tissue culture study revealed that these compounds have the ability to inhibit both testosterone and estrogen. These constituents of broccoli inhibit cancer by inhibiting a cell growth factor. The researchers concluded that, based on the results of their preliminary tissue culture study, broccoli shows good potential as a cancer-preventive food source. A study published in the 2011 issue of the journal "Nutrition and Cancer" compared the relative absorption of sulforaphane from broccoli sprouts and broccoli powder and found that a combination of the two showed a synergistic effect, whereby broccoli sprouts enhanced absorption of sulforaphane from broccoli. Participants in the study consumed four meals to which were added 2 g of broccoli sprouts, 2 g of broccoli powder, both or neither. 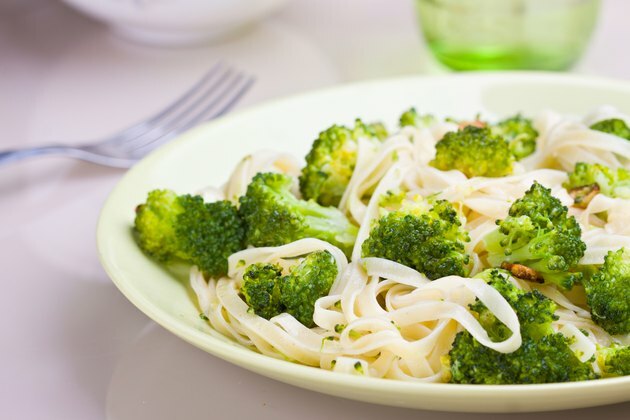 Sulforophane absorption, as measured by the amount excreted in urine, was 19 percent for the broccoli alone and 49 percent for the combination of broccoli with broccoli sprouts. Broccoli sprouts alone showed the highest absorption, at 74 percent. Broccoli sprouts are heart-healthy, according to a study published in the September 2010 issue of the journal "Plant Foods for Human Nutrition." In the laboratory animal study, diets consisting of 2 percent broccoli sprouts for 10 days resulted in lower markers for heart cell damage and up to 86 percent decreased apoptosis -- programmed cell death. Markers for oxidative stress also decreased in the group that consumed broccoli sprouts compared with a control group that did not receive broccoli sprouts. Liver antioxidants also increased with broccoli sprout supplementation. The researchers concluded that short-term consumption of broccoli sprouts showed strong cardioprotective benefits in this preliminary animal study. What Are the Benefits of Spinach in Smoothies?